Recommended to: Readers who are okay with real, harsh issues in their writing. 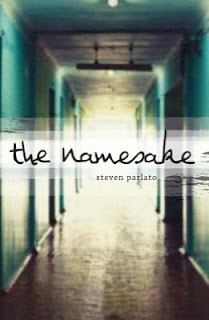 Steven Parlato’s The Namesake totally knocked me off my feet. I can't honestly say that it was an easy read. It is emotionally draining and as gritty as they come. Parlato delves into the topic of abuse in a way that is original and thought provoking. At first glance this book seems like any other coming-of-age book. Evan is a protagonist who has recently lost his father to suicide. He is still trying to deal with everything that comes after, especially with the emotional basket case his mother has become. Evan is smart, witty and sarcastic. It was easy to fall into the quirky writing style and into his life. Then, things get dark. Evan discovers his father's journal, and enters the world of a man who he only thought he actually knew. The writing style turns from quirky to mysterious and sad, and it's hard not to follow him into the darkness. Religion plays a huge part in this novel as Evan searches for the meaning behind everything that has happened. In fact, the character growth in The Namesake is really what drew me in. Instead of falling into depression, Evan fights backs and looks for answers. I realize that this review is probably fairly close to rambling, but that is how conflicted my feelings were after finishing. The Namesake is full of heartbreaking and real life issues. It reminds the reader that no matter how pristine people are on the surface, the darkness can always lie within. This is the type of book that keeps you reading, especially if you enjoy dark humor. It's jarring to be sure, but well worth your time.